I left home 55 days ago and have bike for 40 days. As you can see it wasn’t a very direct route to the start of The Danube Bike Trail which I’m now 65% completed in 18 days of biking plus a couple of rest days. Some statistics also from Adze. 89,846 GPS locations roughly 44 yards apart giving a distance biked of 2261 miles. 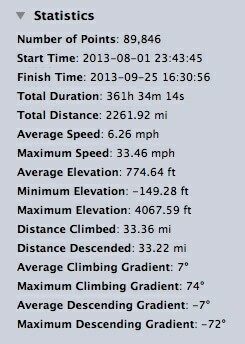 I think the amount of climbing is a bit screwed up as it says I’ve climbed over 33 miles! I’m now taking a couple of weeks break from the Danube, returning to Budapest & exploring Hungary with Sally. 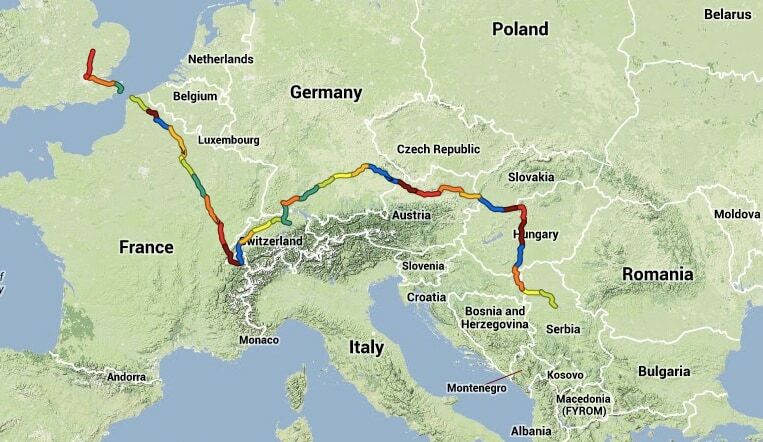 After she goes home I think the next goal is getting to The Black Sea. Then I will have to work out the next phase. The first job on entering a country is to get the internet fixed on the phone, especially when @threeuk want £6 per megabyte! So straight into the Vip shop where to my surprise and utter delight I walked out 5 minutes later with a nano sim already online with 300 megabytes of data for 300RSD (£2.20). or 8000 times cheaper than 3. Why is it that non EU countries are so efficient at getting you on the internet so quickly and cheaply. 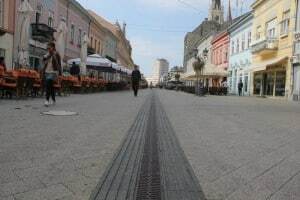 Another thing that caught my eye in Novi Sad is that the central area is all in new paving blocks. However, contrary to every other place that is taking part in this mania. Here they have paved the whole lot with no kerbs etc etc and just a large central gridded drain. How much cheaper must that be to do than all the angle grinding of concrete kerbs, fiddly drains that block up etc. Then it was across the vast plain with it’s huge clouds of tiny winged insects making for very uncomfortable riding plus the atrocious driving with a totally new twist, slamming your car in reverse and ramming it down the road to get into a parking space you missed 5 minutes ago. So I did get into Belgrade down, what could be, a very attractive street. Except the ancient cobbles were all loose with big holes where a cobble had disappeared . It’s interesting how all towns were cobbled (Cambridge had the luxury of wooden blocks, so as not to upset the dons with noise) only to get them modernised & covered in tarmac, now to return to cobbles. The Vila Terazije is OK ,nice and central as the disco beat outside last night proved. It has the most complicated shower ever with an inbuilt radio more jets & buttons than necessary and must be a nightmare to keep clean. Today I’m off to find my hero’s museum. The inventor of the 20th century Tesla!, radio, AC power etc are all down to him. I went to see his birthplace with Emily 12 years ago and also visited where he died, a broken man, In New York. At last he is getting credit over Edison & Marconi who ruthlessly ripped of his designs & denied him credit. 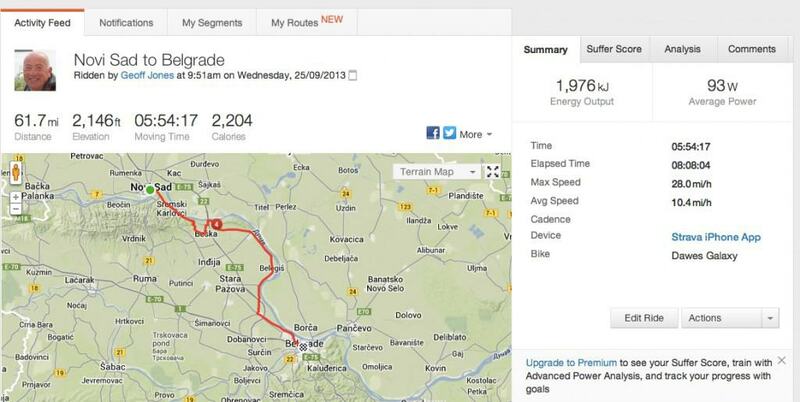 The Strava for the 62 miles yesterday is below and the pictures are here. That makes it 1.674 miles since leaving Cambridge 54 days ago & yep I’m loving it 🙂 There is now a two week interlude from biking the Danube as I’m off walking in Hungary with Sally who won’t be in Norfolk!